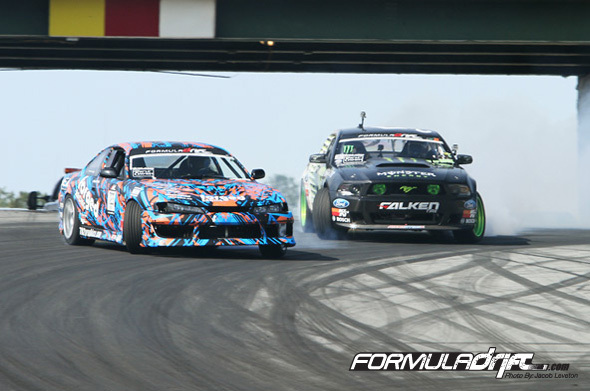 One of the greatest competition changes made by Formula D over the years was the shift from top 16 to top 32 tandem back in 2009. This shift has doubled the opportunities for up-and-coming drivers to compete in tandem competition side-by-side against the biggest names in the sport, as well as shaken up points structure. Qualifying for the tandem battles used to be reserved for the experienced and elite, with the occasional rookie making the field. Now, the majority of the drivers at any given event will be proving themselves in a judged tandem battle on Saturday, not packing it up early Friday evening. Because of that additional experience, names like Odi Bakchis, Ryan Kado, Matt Field, and Walker Wilkerson are quickly rising up the points standings. As part of earning Rookie-of-the-year honors, Odi was interviewed for the 2012 Fan Guide. One of the questions we asked him who he gets excited to tandem against. Odi mentioned that he would prefer to get paired up against a top-10 driver because he knows he will learn something new in those tandems. Last year, Odi faced Dai Yoshihara (Long Beach), Vaughn Gittin Jr (Atlanta), Rhys Millen (West Palm Beach), and Joon Maeng (New Jersey) in his first four top-32 tandem battles, all of them ended in a losing effort. After Bakchis finally won his first tandem battle in a tight matchup with Robbie Nishida in Seattle, he was rewarded with a rematch against Gittin Jr. The experience of the first 5 rounds would finally pay off in Vegas where Bakchis was able to defeat Otto Graven, Justin Pawlak, and Toshiki Yoshioka before falling to Rhys Millen in the Final 4 and losing to Matt Powers in the consolation matchup. Odi’s run of success in Vegas almost single-handedly earned him the Rookie-of-the-year honors. This year’s rookie class is looking to be the biggest one to date. As a result, you may see some unexpected names winning a few tandem rounds. Two rounds into this season, eight different rookies have made top 32 and fifteen more have made a qualifying pass. Daigo Saito is undeniably the most well-known rookie this season, but don’t sleep on the rest of the rookie class. Back in 2008, Michihiro Takatori used a 2nd place finish in Atlanta and a pair of 4th place finishes in Vegas and Irwindale to earn the Rookie of the Year honors. Also in that rookie class, a pair of drivers by the name of Justin Pawlak and Pat Mordaunt ran as privateers, trying to prove their abilities. Fast forward a few years and both Pawlak and Mordaunt are driving with some of the best teams in the series. 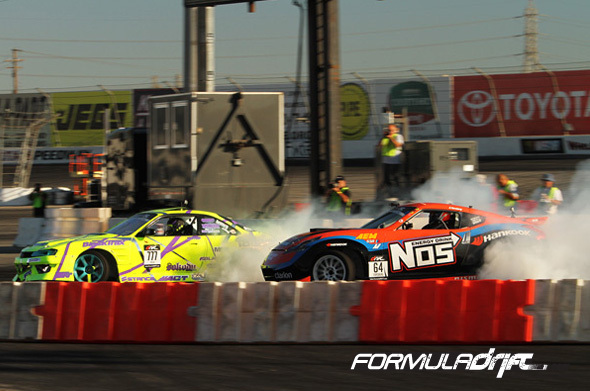 In 2009, the first year in which Formula D expanded to top-32 tandem format, we caught an early glimpse of how awesome the tandem battles can be in the round of 32. Mike Essa had a great battle with Tyler McQuarrie, unfortunately not having enough to move past the Falken Tire 350Z. 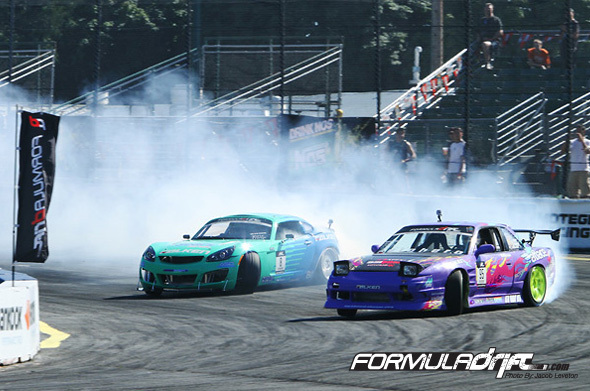 But the most exciting tandem battle came between 2nd qualifier Dai Yoshihara and 31st qualifier Pat Mordaunt. Pat put on four stellar runs, two in the original battle and two more in the one-more-time battle, to knock out Yoshihara’s Discount Tire IS350. Entering this year’s event, it seemed that it wasn’t a matter of if there would be first round upsets but who they would be. If the names Dai Yoshihara, Chris Forsberg, Tyler McQuarrie, Ken Gushi, Darren McNamara, Robbie Nishida, and Conrad Grunewald ring a bell, they should. Between them, they have 10 event wins, 16 other podium finishes, and 2 championships over the last 3 seasons alone. In any given event, any of these drivers could be in the top 8 or beyond. However in Atlanta, this was the list of drivers who were watching Top 16 opening ceremonies from the stands, eliminated in the round of 32. Just a few short years ago, today’s FD freshmen and sophomores were looking up to these drivers. Now, they’re ranked higher than them in the points standings. All thanks to top 32 tandems.